A mountain rescue team described as a ‘total waste of time’ a callout to a young woman who rang for help from a Snowdonia mountain. Ogwen Valley Mountain Rescue Organisation’s volunteers went to the incident on Saturday and a Coastguard helicopter also flew to the scene on Moel Siabod. The callout came during a busy weekend for Snowdonia’s rescuers, during which Llanberis Mountain Rescue Team was called to aid two injured people on Crib Goch on Snowdon in separate incidents. 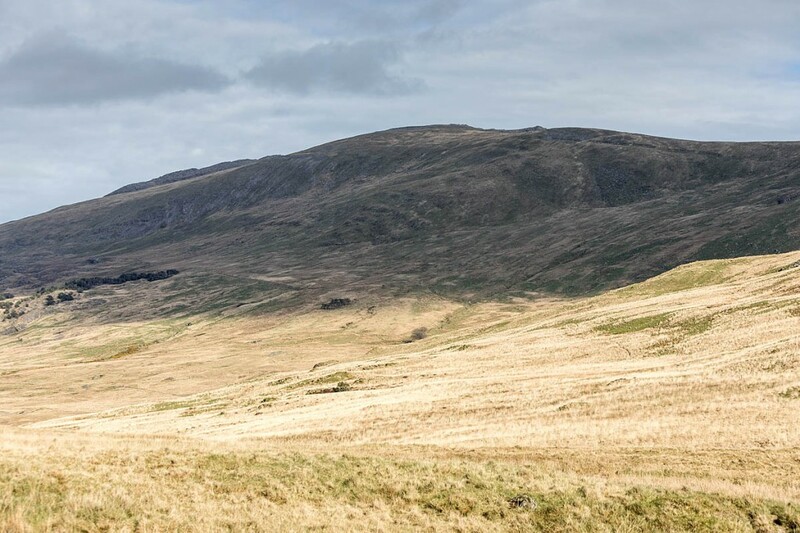 The Caernarfon Coastguard helicopter crew winched both casualties from the mountain and flew them to hospital in Bangor before making their way to the Nantlle Ridge where Aberglaslyn MRT was tending to a hillwalker who had suffered serious head injuries in a fall. The walker was flown to the major trauma centre at the Royal Stoke University Hospital. The St Athan Coastguard helicopter also flew up from south Wales to aid Aberdyfi Search and Rescue Team, which had gone to the aid of two runners injured on Cadair Idris in separate incidents. Ogwen Valley MRO was alerted to the Moel Siabod incident shortly before 5pm. Chris Lloyd of the team said a young couple had ascended the mountain south-west of Capel Curig on a fine summer day. He said: “On their descent, the young woman twisted her knee. As she didn’t want to risk aggravating the injury, she sat down and her partner telephoned North Wales Police for mountain rescue. “The Ogwen team leader was contacted. He telephoned the informant to try to establish where they were and the extent on the injury. The team leader explained that as the helicopter was busy with other calls, it was unlikely it would be available for over an hour, therefore team members would walk up with a stretcher. “I believe that the man demanded to know why they could not be rescued sooner by helicopter. “As team members left their Land Rovers high up on the east slopes of the mountain, the MCA’s Rescue 936 helicopter arrived over the summit. With some careful flying, the crew were able to winch the couple aboard and fly them down to Oggi Base. “I am unsure of the magic potion used by the winchman because the woman was able to jump down off the aircraft and walk the 100m to Oggi Base without signs of injury. “The couple, dressed only in shorts and t-shirts, one in gym shoes, the other in trainers, were not carrying any rucksack or bags at all. “They had no map, no spare clothing to protect them from the cooling breeze on the tops, no spare food or drink and no idea. “This was a total waste of time for the volunteers of the mountain rescue team, who had their Saturday evening plans interrupted for no good reason and the crew of the helicopter who already had a demanding day with multiple incidents. “Team leaders have to depend upon the information provided by the informant and act accordingly. There was no apparent reason why this couple could not have walked off Moel Siabod, though they did not know where they were; they had no drink or food; they had no spare clothing for the increasing cool breeze on the tops and, should the descent have taken some time, they had no torch. The crew of the Maritime and Coastguard Agency helicopter was also in action on Sunday. Early in the morning they recovered the body of an angler who had fallen from the cliffs of the Great Orme, near Llandudno into the sea. Soon afterwards they received a call to a fallen rock-climber with very serious head injuries on Dinas Cromlech in Llanberis Pass. The casualty was flown directly to Stoke-on-Trent. On their return, they airlifted a woman with a suspected broken ankle from the slopes of Cnicht, north-east of Porthmadog. Idiots like these should be made to pay for their "rescue". the hills unprepared and ill equipped, this is stupidity personified. their actions are deliberately negligent. individuals with no modicum of basic common sense! I once got up and down that mountain in Arctic conditions with a windchill of -25C. It was possible when you're wearing the right gear and know what you're doing. It's incredible that on a nice sunny day they could be so inept. If you have to be rescued in France for going off piste without equipment and guide, you have to pay a large fine, which can then be used towards genuine emergencies. Maybe this should happen in cases like this. Absolute waste of time and resources these cretins should be made to pay... They could have had another serious call and be helping someone in real trouble... Selfish it's!! The problem is that most of the UK's population are thick and selfish. On Sunday my wife and I did a 16.5 mile circuit from Keld. On arriving back at the village where the benches are by the waterfall I noticed 2 empty plastic water bottles just chucked on the floor. My wife said no matter how tired I am I'm going to pick them up. We carried them back up to the village and put them in the bin. It wasn't that hard, but the point is why do these idiots even come to these places when that's their mentality? Like a rescue only being a phone call away when you're a bit tired. It's because they can and there's always someone else to do it for them. My wife once fell down a mountainside and ended up with a badly lacerated and fractured finger as well as bruising all over her body. I patched her up with my First Aid kit and said well you can either sit here in the cold for an hour or more waiting for MRT or we can walk back the 5 miles to the car. We walked and presented to our local hospital that evening. Agree with previous poster sentiments, and wonder whether the rescue services are duty-bound to fly them from their location? Surely, the winch-man/MRT can assess the "casualty", diagnose accordingly, provide directions to their car and leave them to it? Well done MRT for you're outrageous comments to the so called casualty. Interesting comments Fat....Most of the population are thick....Muppets etc. Walk 1000 and Tv are getting more people out walking but with little knowledge and you cant refuse to rescue someone if they call for help so whats the answer. Maybe notice boards at the start of some honeypot routes and i mean big ones explaining what the route is like , weather conditions on route and on summit , equipment clothes needed and finely what a rescue will cost the taxpayer for the helicopter and the rescue teams are volunteers spell it out load and clear and hopefully one day the message will get through. Too many people out on the hills now for my liking. No longer the peace and solitude it once was, and the problem is one of reverse-gentrification in that it's the great unwashed, feckless masses taking to the hills with no idea what they're doing, no respect for the once-pristine scenery and often no real appreciation of the landscapes they find themselves in - see either of the 3 Peaks locations for ample evidence of this - all are no-go zones from April-Oct now. If other emergency services can fine people for hoax/inappropriate use of Emergency services, then so should Mountain Rescue. To go out walking - anywhere, without the proper equipment, even a bottle of water, is reckless and asking for trouble; and whilst a twisted ankle can hurt, some rest usually rights it - its not a emergency. People are too soft nowadays, and expect someone else to take responsibility for their ineptitude. Its time to toughen up on time wasters and the ignorant - hit them where it hurts - their pockets. I am ashamed of the comments on this site. The rescue account suggests the couple who called for the rescue were not experienced in the outdoors and perhaps selfish in their attitude. But who are you, dear critics, to be so vitriolic? I suggest instead an encouraging attitude to novices that they could improve their skills. And you, dear critics, could reflect on your whether or not the terms 'negative' and 'sneering' apply to you. I think Mary was the woman rescued. You are so out of touch, perhaps 'PipeDownLuv' has indeed got you sussed? The fact is the young woman wasn't badly injured, in fact it appears she was putting it on so that the pair of them could get a lift back down to their car. That is selfish laziness, pure and simple. When I commenced my fell-walking, some 25+ years ago, I wasn't dressed in best outdoor gear but at least I had a reasonable (cheap) pair of boots, a cheap rucksack, a reasonable waterproof jacket and a map (in time I bought a compass too). I also took a sweater with me (until I heard of fleece jackets) and always had food and water. I learnt my craft over time, sometimes by learning from mistakes, and now consider myself a seasoned fell-walker. Thankfully, I have never had to call on Mountain Rescue (I still drop money in their boxes on regular occasions though) but would never dream of calling them because I felt tired. Too many (but not all thankfully) of the young ones today believe the world deserves them a favour. No doubt Mammy and Daddy brought these two up to believe they're special and that everything would be done for them. Well if it had been me, I'd have told the pair of them to get back in the helicopter and them dropped them further up Moel Siabod tan where they were picked up from and told them to walk down themselves. That way they would have learnt a valuable lesson. As things stand, they think next time they can call Mountain Rescue again and they'll be given another lift. These people were stupid but some of the comments on here are great examples of the self-righteous idiots that everyone associates with walkers now. You could all do with coming down off of the pedestal you put yourselves on. Everyone makes mistakes in life, you haven’t been perfect everyday so get your heads out of your arses. Rant,rant, rant, rant, rant, rant, rant,rant, rant, rant, rant, rant,rant and rant. I agree with Mary. Sanctimonious old people making judgements based on very limited information. Mind your own business. YOU people need to get real. Read the article, the injury was put on. I.m happy to read that the team leader made the couple aware of his feelings. But those of you who say they simply made a 'mistake'. WHAT?? ?